www.saranobledesigns.com My master closet done in black. A little bit of heaven for me. For sure I can work on staging but this gives you a good idea of my master closet. I know I have too many shoes. To my defense, I believe in classics and some of those shoes are over 10 years old and I still wear them. My latest pair is a bedazzler's dream. I LOVE them. They are a much cheaper take on the Valentino studded heel. Ellie, my 13 year old, says I'm too old for them. I say, if I can walk in them, I'm young enough. I had a great client who told me about her Grandmother, who she clearly adored, and how they had to take her heels away from her at the nursery home because it had become a hazard to her health. I hope that's me in 40 years. I digress, what I really want to tell you about as we continue down the progression of building our home, are the closets. The trim carpenter plays a vital role in creating functional spaces. 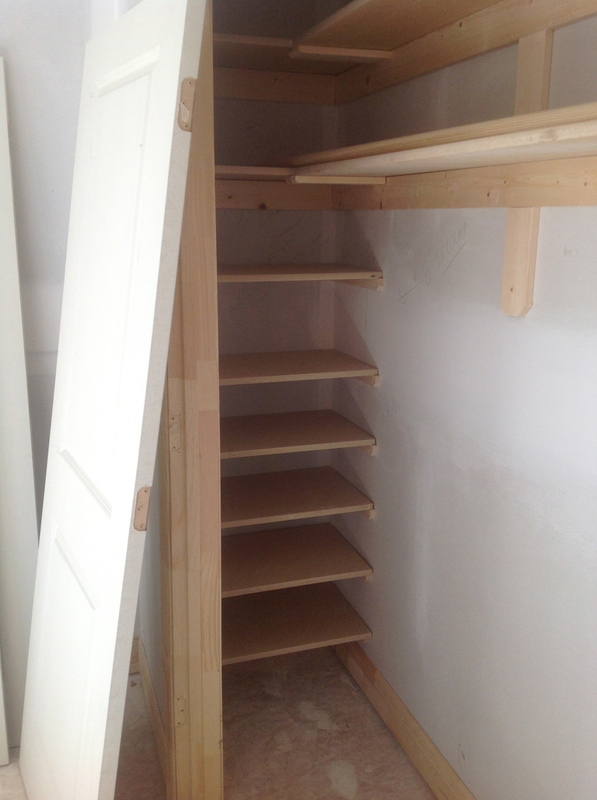 I added lots of "stacks", built in shelves, to make each closet more useable. For the kids, I purchased simple and inexpensive plastic tubs that act as their dresser drawers, and then I had each stack made specifically to fit each tub. My closet was a little more involved as I made my shrine to my shoes. I knew approximately how many boots and how many flats I had and I made cubbies to accommodate. I added multiple stacks for sweaters, jeans, etc but I wanted them a certain size so I wasn't wasting space. It was clear early on this is not the norm on a build job. We would get our additional stack but it would be a standard set of shelves that were not spaced to my drawing. On the third try in the master I told the builder it was good enough and to his credit he said no, we'll get it right. Thank you Chris George Custom Homes. So finally it was perfect. Then just to throw everyone off I painted the entire thing black. I got a lot of questioning about it, but I was pretty sure it was going to be fabulous and luck has it I was right :) I painted an IKEA light gold, added a roman shade in Groundworks fabric and I love it. Eventually I want a built-in dresser below the light and I imagine a glass top with pull out trays that display my (cheap) but pretty jewelry. Someday. Until then I'm thrilled.